Every Wednesday, we try to evaluate the overall job of the defense by breaking things down in great depth. Like the Tuesday column on the offense, this might not be for everyone, but if you really like studying the finer points of football, follow along on this weekly journey. The Cowboys defense is under construction. They are trying to add new toys (Byron Jones, Randy Gregory, Sean Lee, and soon Greg Hardy) to the 2014 defense that was plucky and opportunistic to see if in fact they can build a defense that is a bit more menacing and effective. This, of course, like everything in football, is a process. 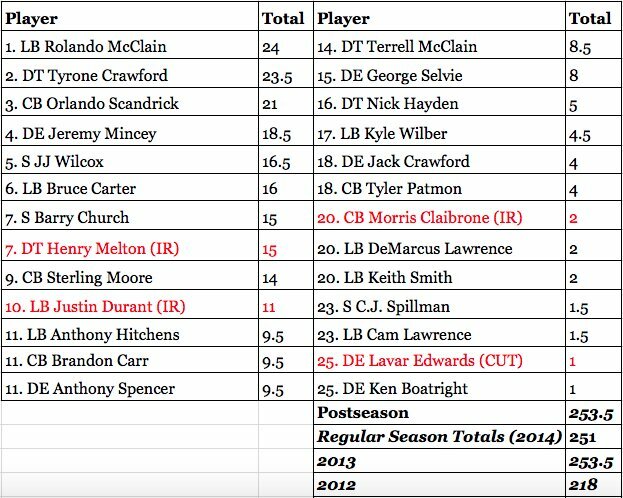 Especially if main pieces from the 2014 defense are gone - Orlando Scandrick, Henry Melton, Justin Durant, Anthony Spencer, Bruce Carter, Sterling Moore, and George Selvie were all in the Top 15 defenders last season - and Rolando McClain is missing for 3 more games. So, early on, we are just trying to get a feel for who does what and what sort of ideas Rod Marinelli has for deployment of his troops in terms of coverages and pass rush tactics. As we go, we will track statistical trends, but let's start with who plays where and does what in 2015 (at least through week 1). When you are looking at defensive personnel on the Cowboys, divide the defense into two groups. The Defensive Line - or "Rush-Men" as Marinelli refers to them and the back 7. The Back 7 will always be the linebackers and the defensive backs and for purposes of simplicity, we combine them when we want to understand who plays in what situation. Much like the offense, before every play, the coaches will yell out a group and those players charge on to the field. 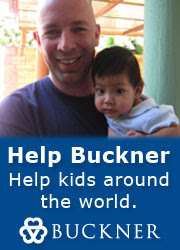 But, unlike the offenses, it is not at the selection of the coaches. It is a direct reaction to the opponent's offensive choices. Up in the coaches box, there is generally a coach with binoculars who is watching the opposition's offense. If you are familiar with personnel groupings for the offense (read yesterday's piece that covered this), you know that when the opponent runs 11 personnel on the field the defense will have a different group of players to defend them than if they bring out 13 personnel. This happens when the man with the binoculars sees the offensive changes, calls down to the coaches on the sideline of the defense, alerts them to the change, and then the coaches downstairs change accordingly. This all must happen in seconds and the players must know A) their groupings (which can become complicated during a game when injuries change everything and B) their specific role with that grouping. If they don't, coverages are blown, and games are lost. They used the "base" against the Giants when the Giants were in "12" personnel and generally in early downs and distance. This means 1st and 10 and 2nd and normal. They used the "nickel" against the Giants when they saw "11" personnel which is the preferred Giants personnel grouping. They are a 3 WR team and will usually play the majority of the game in that group. It helps that Victor Cruz was unavailable to matchup well, but when this group is out there - most of the time - it means Wilber leaves the field and Tyler Patmon is on to play the slot. Then, the Cowboys used "dime" about a dozen times or so, which means that Wilber and Hitchens both leave the field, and on comes Patmon and rookie Byron Jones. Jones is on to cover the Giants TE Larry Donnell (often in man to man) and this look was used exclusively on 3rd downs. They brought that group on the field in pretty much every single 3rd down the Giants used. If you can quickly spot what the Giants are using in personnel, you can then confirm what the Cowboys are doing to counter it. Remember, the rosters in the NFL are not huge and therefore, identifying the role of each player comes pretty quickly. They can only use so many guys. As for the Rush-men, they also have a rotation and on Sunday that was dealt a major blow by Randy Gregory going down to injury. With no Gregory and no Hardy on Sunday in Philadelphia, you can bet the Eagles game plan will start with wearing down the Cowboys front and the idea that only Jeremy Mincey and DeMarcus Lawrence are preferred Defensive Ends in this current mix. Ryan Russell will have an opportunity, but they are a bit shorthanded at end. Meanwhile inside, they have a number of choices and used Tyrone Crawford and Nick Hayden plenty, with Jack Crawford and Terrell McClain both in on about 25 snaps each. Remember, the Cowboys are a 4-man rush team. They will blitz, but less than almost everyone else in the league. The NFL average last year was over 30% for blitzing and the Cowboys were at about 17%. On Sunday they brought an extra man or two on just 5 out of 36 passing plays (13%). They want 7 men to play coverage. It is their philosophy and belief system. OK, let's look at the important numbers that color in the details of the game. 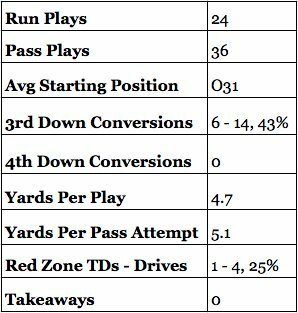 The Cowboys were able to generate some very impressive stats defensively that tell you they played a fine game - aside from needing to get more to the QB and of course, taking the ball away. You may recall the fact I mentioned on Monday that the Cowboys have not won a game in the Jason Garrett era in which they did not take the ball away one time until Sunday Night. They had lost 18 in a row with that distinction until Sunday Night (a streak that goes back to October of 2009). Bottom line, you usually must get the ball away from your opponent if you wish to win in the NFL. But, overall, the yards per play were magnificent. Eli Manning at 5.1 YPA? Brilliant work. Odell Beckham was a factor, but a very limited factor and most importantly, there were 4 trips into the Cowboys red zone by the Giants and they only cashed in once - the time they received the ball at the 1-yard line. That is really good work overall. Also, they only had 60 snaps against. Remember, the key to last season was playing almost 200 less snaps on defense than they did in 2013. In 2013, they played about 68 snaps a game and in 2014 it was down to about 61. Good stuff to report here. What is a splash play? Well, for purposes of this blog I believe a splash play will include the following: A sack, a pressure that forces a bad throw, and big hit on the QB, and a batted ball that may lead to an interception opportunity. Again, you can see how this leads to subjectivity, but a subjective breakdown is better than no breakdown at all, I have decided. In addition, a splash play will include tackles for loss, a big hit for a short gain, or a stop which is an open field tackle where a player is pulled down on 3rd down short of the marker because of an exceptional effort from a defender. An interception is clearly a splash play, but so is a defended pass that required a great effort. A major hit in the secondary could be a splash play, but I believe that the outcome of the play will determine that (did the ball come loose?). Sorry, defensive backs, but standing over a guy who just caught a 15 yard pass because you think you hit him hard will not generally pass the test on this blog. So, stop doing it. So, to the right here are the Splashes in Week 1 against the Giants. To be honest, the total number of 9 is actually a low number, but again, the team was able to stop drives. 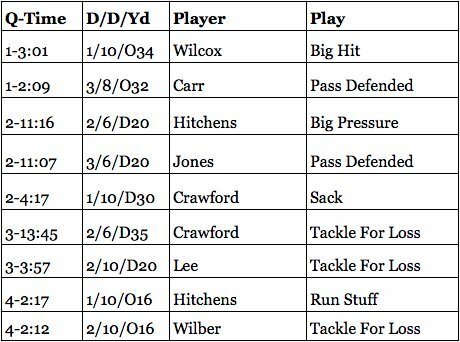 Of course, the Giants helped with a couple brutal dropped passes, but you can now see on the list that the team had some good contributions from their new $45 million dollar man, Tyrone Crawford and the man back at Linebacker and wearing #50, the team leader, Sean Lee. Sean Lee is back, everyone. We can only imagine how this team will continue to develop in the right direction if his durability cooperates and we can finally see what Lee next to Rolando McClain might look like. Very exciting. OK, now we are down to the weekly data points we keep on this Wednesday column. Below, we want to track how the Cowboys rushed and how often they sent rushers and in which situation they decided to blitz. A very important item to track is explosives. These are offensive plays of 20+ yards. Coaches will tell you this is a very important thing - offenses want them and defenses want to stop them. If you limit them, you have an elite defense. If you are allowing 6 in a game, you are likely going to lose. Week 1? The Cowboys were almost completely clean. Just this late 4th Quarter run by Rashad Jennings happened. Any time you play a competent offense and only allow 1 splash, you are quite pleased. Every week, we will pick something the opposition does well and try to figure out how the Cowboys were going to deal with it. This week, it is making sure Odell Beckham didn't wreck the game-plan. Honestly, JJ Wilcox hitting him as hard as he did early in the game might be the most notable thing about this matchup until he made that apparent "game clinching" catch in the 4th on 3rd and long, but my man, John Daigle, made this chart of Beckham versus the Cowboys on Sunday night including color coding to show you who was trying to cover Odell and where the ball was being caught relative to the line of scrimmage. The two big catches were the filled in black dot on the upper left (that 3rd Down play) and then a quick slant out of the slot against Patmon in man coverage earlier in the game. But, again, the Cowboys are more than fine with 44 yards on 8 targets to that weapon. The Cowboys won a game they likely should have lost after 3 giveaways and 0 takeaways. But, to their credit, they did many little things to put together a solid defensive performance overall. No giant explosives, no Beckham efforts that were unstoppable. They kept Eli in check and got off the field, limiting damage with Field Goals instead of Touchdowns. Overall, the Cowboys mixed coverages plenty. People ask are they more of a zone team or a man team, and the answer is that the Cowboys blend coverages a ton. They play a lot of man coverage and early on that seemed like all they were doing. But as the game developed, they switched to a majority of zones, with all sorts of zones mixed in. I was asked about 4 players individual efforts so let's cover those here: Sean Lee was solid and made a few nice plays in his first time back, but man, Philadelphia is going to go right after him to test his wheels. Mo Claiborne was fine as well. He played the maximum number of snaps and demonstrated good cover ability in his first game back. He also looked like he was happy to let other people tackle, but I assume that was first game tentativeness. Randy Gregory was giving Ereck Flowers a clinic when he got hurt, but let's be happy he isn't more seriously injured. And, Byron Jones was very limited, but looked aggressive and confident when they called for him in Dime. Overall, that was a nice opening effort, but now the Eagles are going to present an explosive offense that tests you vertically and horizontally better than the Giants can. Also, they will test that running defense from sideline to sideline. So, let's wait a bit to see that game and several more behind it before we declare concrete conclusions about the 2015 Cowboys defense.